In a union of magic and storytelling, today Disney has opened its first resort in Hawaii, called Aulani. The new resort in Ko Olina is not a theme park, but a chance for Hawaiian culture to be shared and celebrated through the eyes of Disney, not with an emphasis on Mickey Mouse, but instead on offering local traditions and beauty to family vacationers. 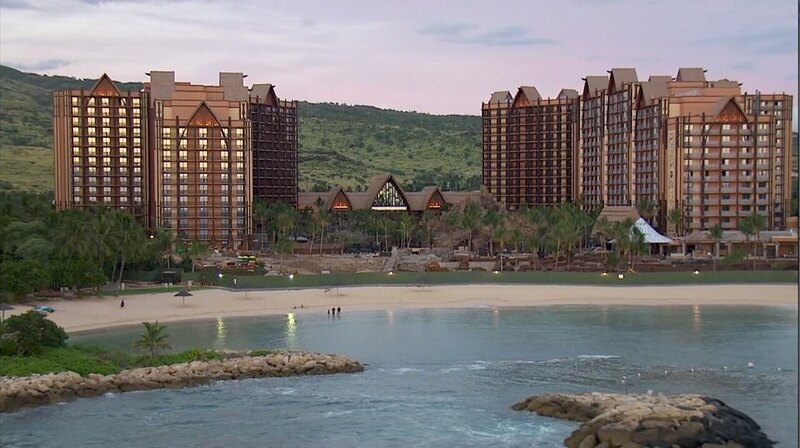 The first phase of Aulani opens today, with the entire resort covering 21 acres in Ko Olina, 17 miles from Honolulu International Airport and approximately 30 minutes from Waikiki. When complete, Aulani will feature 460 Disney Vacation Club Villas, including 21 Grand Villas, as well as 359 hotel rooms, including 16 suites. Two towering buildings bookend a center lobby, courtyard, and winding pool area, which are all set alongside beach and ocean views. Throughout Aulani, guests will find 4 restaurants, 2 lounges, and 10 recreation facilities which include an 18,000-square-foot spa with 15 treatment rooms and fitness center, 4 whirlpool spas, a 14,545-square-foot conference center, and 36,695 square feet of outdoor venues. And the themed pool area has plenty of features to enjoy including a swimming pool, wading pool, tube slides, sunset-facing hot tubs and a snorkel lagoon. 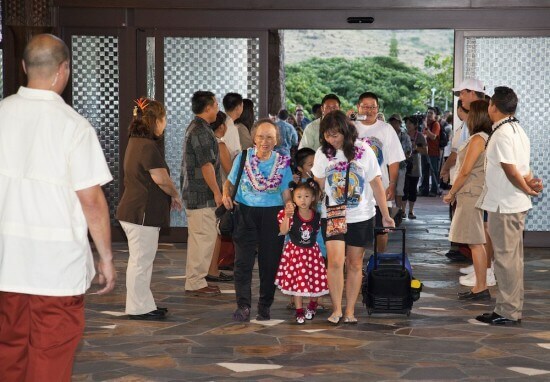 ABOVE: Vacationers including the Chun family – 3-year-old Lauren, brother Landon, parents Laura and Brandon, and grandmother Norma Lum – entered the lobby of Aulani, a Disney Resort & Spa, Ko Olina, Hawaii, as its doors opened to guests for the first time today. BELOW: Tom Staggs greets Samson Mahi of Waipahu, Oahu, and his family – the honorary “first family” to enter Aulani. 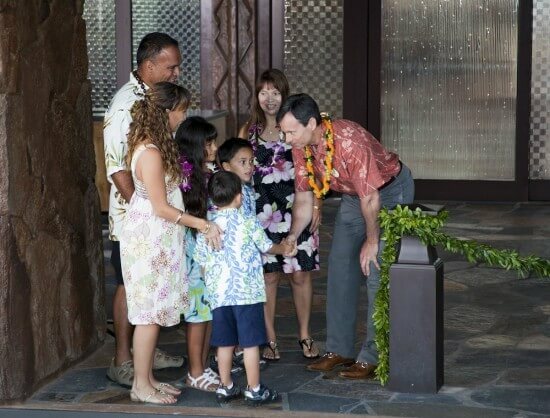 BELOW: Goofy took the time to greet guests at Aulani’s opening as well. But with all of Hawaii’s natural beauty, what does it mean for Disney to be in Hawaii? In sitting down with those in charge of creating Aulani back in June, it became quite clear that Aulani was much more than familiar animated characters and themed entertainment. 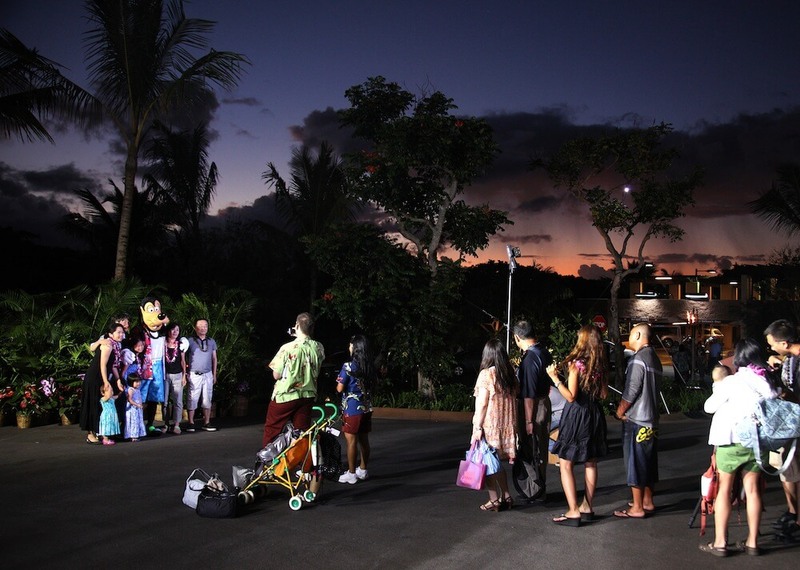 In the interview below, Imagineers Joe Rohde and Jeanette Lomboy along with Vice President of Aulani Djuan Rivers explain exactly how Disney is able to help tell Hawaii’s existing stories. So while chance encounters with Donald Duck may occur in Aulani, it’s not the driving force behind the design of the resort. A family traveling to Aulani will still find a Hawaiian vacation, but one that is enhanced by Disney’s level of service and comfort. It’s not necessarily the Disney version of Hawaii, but instead Hawaii showcased through Disney’s point of view – which is not all that dissimilar with traditions of the islands. While there’s plenty of Disney and Hawaiian magic surrounding the resort, it’s the rooms that all guests at Aulani will return to each night. And Aulani has no shortage of rooms, from detailed single-room hotel rooms to elaborate suites. Each Aulani room features touches by local Hawaiian artisans including earth-tone print fabrics inspired by native kapa cloth. Furnishings pay homage to a variety of ancient Hawaiian artifacts, from fish hooks to outrigger canoe sails to kapa “beaters,” a tool used to create the highly prized kapa cloth. Outrigger canoe posts and beams work their way into the design of bedroom headboards. Butterfly joints incorporated into the headboards evoke the ancient Hawaiians’ method for artfully repairing their prized wood calabash bowls. A clever wall mirror is framed in what appears to be oversized, interlocking, carved wooden fishhooks. And there is a bit of Disney in every room as well. Hidden Mickeys can be found in pineapple-patterned Hawaiian quilts. The living room floor lamp reveals a silhouette of Minnie Mouse when illuminated. Hidden Mickeys are also camouflaged within the wall coverings’ patterned surfaces. Hotel rooms at Aulani start at around $400 per night for a 420-square-foot room. Add $150 to that for an ocean-view room, at closer to $550 per night. The price sounds steep, but it’s comparable to nearby Hawaiian hotels with the same level of comfort and amenities. Those looking more space to spread out might want to check out the two-bedroom, 1,910 square-foot Ahu Ulu Suite at around $2,449 per night. While hotel reservations are open and available, anyone interested in buying into Aulani as part of the Disney Vacation Club will need to wait a bit longer. Time share sales were temporarily halted over the summer as a result of some executive-level miscalculations regarding the resort dues. Disney has not yet scheduled a date on which these sales will resume. Outside of the rooms, Waikolohe Valley offers plenty of water-based fun including the 8,200 square-foot Waikolohe Pool, the Waikolohe Stream lazy and fast-moving rivers, waterslides, Oʻahu’s only private snorkeling lagoon, and Menehune Bridge, an interactive play area that’s just for kids. Far separated from Disney’s Polynesian Resort in Florida, Aulani offers a chance for Disney to share the real Hawaii, but sprinkled with a bit of pixie dust. There are Disney experiences throughout the new resort for those who want to enjoy them, from hidden Mickeys to water park-style fun. But Aulani is more about offering a gateway to the uniqueness of Hawaii than focusing on Disney-branded entertainment. Disney’s Aulani Resort & Spa is now open at Ko Olina, Hawaii. More information about the resort and reservations can be found on the official Aulani web site. In the spirit of Hawaiian culture, I’ll end this article with a traditional song and dance in the video below as presented to the media in June, a performance recently repeated for an audience of thousands of Disney fans at the 2011 D23 Expo. Judging from the photos of your resort it looks inviting enough for Carole & I to visit asap. i cant wait to go when i move to Oahu! If all goes well see you April 21st.